AT OUR VR/36O WEEKEND WORKOUT! Over the course of this weekend workout workshop, you will get hands-on training of both camera gear and production software, allowing you to level up your media skills, or dive into it for the first time. We will feature industry speakers discussing new approaches to creative and production processes, and there will be training on camera gear and editing/compositing software. Through each stage of instruction there will be hands-on experimenting, with an end product that is shot and edited on site. Whether you are just getting started, or are looking for tips and tricks to help you create the best experience, you’ll get to exercise your muscles. Our keynote speaker on Friday evening is Nancy Eperjesy, Co-Founder and CEO of Mettle, the software company that developed the newest editing and compositing plugins adopted into Adobe Creative Cloud for AfterEffects and Premiere. She will share insights on the VR/360 industry, and how these new tools are standardizing production and making it accessible to users, creative and technical alike. 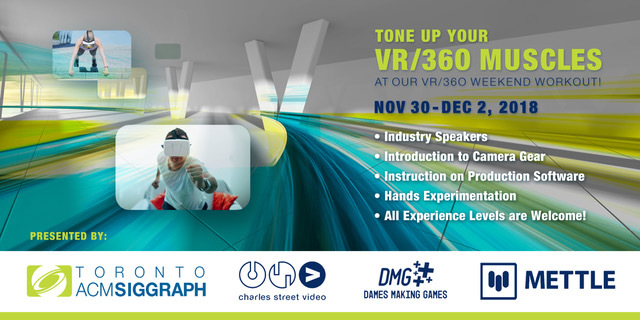 Saturday will feature instructor Mike Dopsa, who will give an overview on the VR/360 production process, camera gear, and shooting 360 footage. He will then give an introduction to the Mettle plugins in AfterEffects and Premiere. Later in the day, he will give specific instruction on the cameras we will be using for the workshop, and then we will be going out to shoot footage in and around the Toronto Media Arts Centre. Sunday features Mike Dopsa again, giving more in-depth and hands-on instruction for the Mettle plugins, which will then be used to import the footage you shot on Saturday, experiment with editing techniques, compositing effects, and export for viewing. Additional concepts will be discussed throughout the weekend, including 360/VR storytelling techniques, sound design and volumetrics. Beer and snacks will be served Friday evening. Light snacks in the morning and lunch will be served Saturday and Sunday.